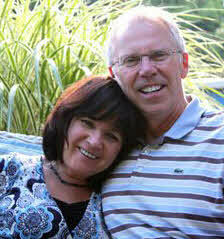 Brian and Candice Simmons have been described as pioneers, prophets, and pastors. As a spiritual father and mother, their teaching and prophetic gifts have opened doors in many nations to take the message of authentic awakening and revival to many. For the last 40 years they have labored to present Christ in His fullness wherever God sends them. After a dramatic conversion to Christ in 1971 Brian answered the call of God to leave everything behind and become a missionary to the tribes. Taking his wife and three children to the jungle of Central America they pioneered church plants for many years with the Kuna people group. While serving as missionaries, Dr. Simmons planted churches and established leadership for the churches that Jesus birthed. As a linguist, Brian also was the co-translator for the Kuna New Testament. While Brian was in the missionary harvest fields God, the Lord of the harvest, spoke in an audible voice early one morning saying: "Revival is coming to North America and YOU will be a part of this.” From that Divine encounter Brian received fresh understanding of God’s prophetic purposes for the last days awakening among the nations. Moving his family back to Nort h America Brian began to preach with power and authority for the coming days of glory that will usher in the return of Christ. After pastoring in Connecticut for 18 years, Brian is the founder and director of Apostolic Resource Center (ARC) based in New England, and they have established Stairway Ministries under which they travel full-time. Having completed his doctoral studies with C. Peter Wagner (WLI) Brian has been commissioned as an apostle to the nations and carries a distinct authority and love for all people. He also is a frequent instructor for Wagner Leadership Institute on prophetic and apostolic topics for the emerging church. He serves as a part of the Apostolic Team of Harvest International Ministries that oversees thousands of churches worldwide. Brian is the author of numerous books that reveal depths of insight that the Holy Spirit has released for the last days. His best-selling book, The Journey of the Bride, has been translated into Korean and French. Other titles Brian has written include: Prayer Partners with Jesus, The Dreamer, The Stairway, The Prophet of Zion, Moses the Deliverer, and The Image-Maker. He is also is committed to finishing the translation of the entire Bible into a new dynamic-equivalent version called, The Passion Translation. See www.passiontranslation.com for more info. Known as dynamic and anointed speakers they now travel the nations releasing this message of end time awakening. Signs and wonders accompany their apostolic ministry.